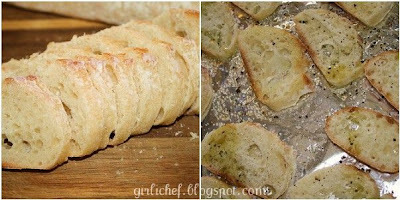 Preheat oven to 350 degrees F. To make crostini, slice the baguette into thin rounds and set on a roasting tray. Drizzle with oil and season with salt and pepper. 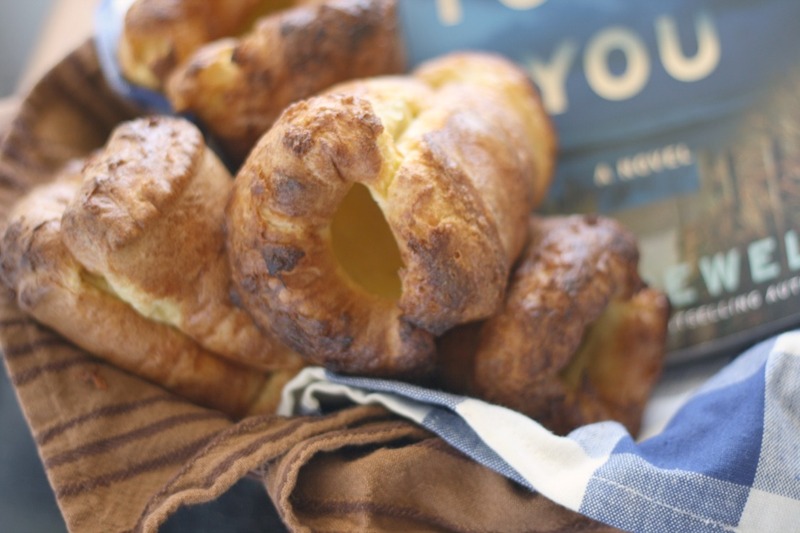 Bake in the preheated oven for 7-8 minutes, until golden, then set aside. Chop up the olives. Drizzle in some olive oil & toss. Add some freshly chopped herbs. See...easy. Place goat cheese on a roasting tray and top with freshly ground black pepper. Bake for 5-7 minutes, until it is warmed through and just starting to melt. Soft goat cheese won't be all gooey and melty like the firm would, but it is still warm & soft. 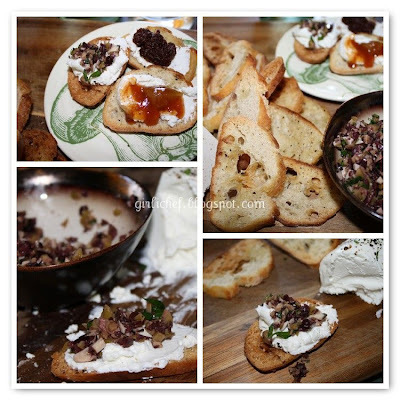 Serve warm goat cheese with crostini and olive tapenade. I also tried serving with some store-bought sun-dried tomato tapenade and some chutney...hmmm, neither were as good. This was a fun afternoon lunch to share, paired with a bottle of white wine. The nice crisp of the crostini with the soft, earthy goat cheese spread and the saltiness of the olives was nicely washed down with a crisp, fruity Pinot Grigio. 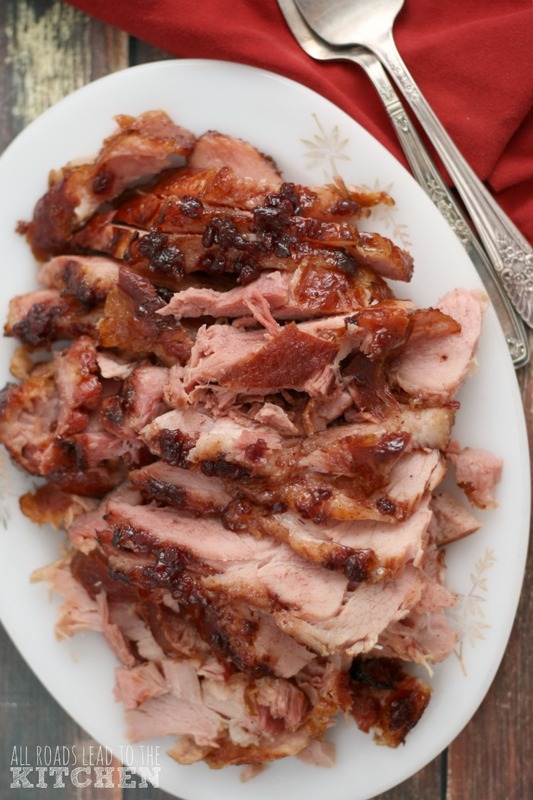 Head on over to Tyler Florence Fridays to see what other Tyler recipes will tempt you this week! ...and hooray, today was the kiddos last day of school!! Perfect way for mom & dad to celebrate. Don't forget to enter my giveaway...time is quickly passing. Mmm...That looks really good. 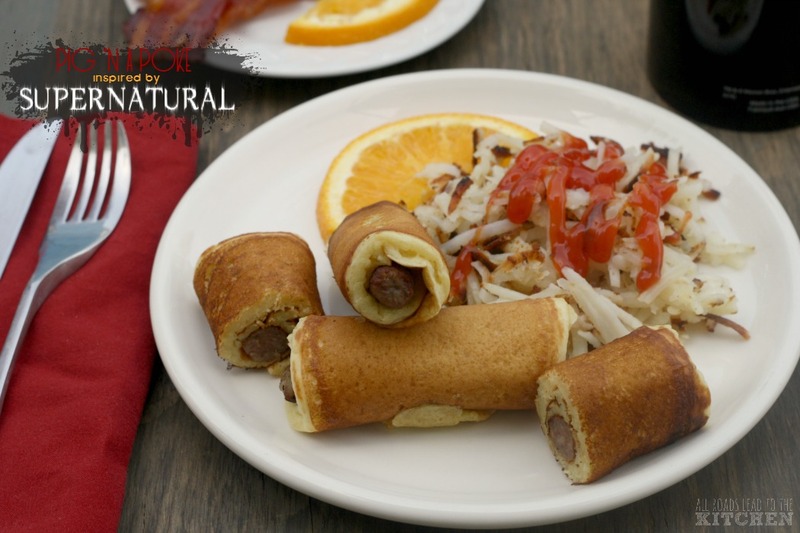 Fun little appetizers or an afternoon snack. Heck I'd take that for lunch and dinner. LOL. I introduced it to my students recently, many loved it, but some shunned it...they will learn to love it! I baked some goat cheese the other night w/ thyme and pink peppercorns and ate it as dinner and this reminded me how good baked goat cheese really is. 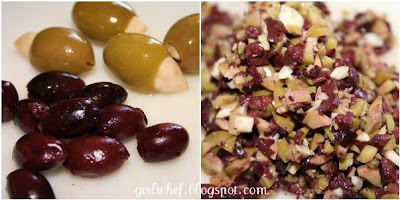 Love the tapenade! I love both elements of this separately. They are probably terrific together. Sounds great! ATC did something like this recently, only breaded. Mmm, I love stuff like this... easy, too! MMMM You had me at Goat cheese! Delicious looking... YUM!! Lord how I loves cheese. We are wanting someone to start a cheese making group - I vote you! I've haven't yet tried goat cheese(I know,I know-shame on me).Does it smell a lot? Growing up,I loved reading Heidi by Johanna Spyri,and read/heard about goat cheese for the first time in it.Also,for some reason I remember only Heidi liked it,and the others turned up their noses at the mention of it!! That sort of has left a lasting impression :)So,do tell me!! Looks great!... I love goat cheese.....and I love that movie! I thought I was the only one that liked it! Girlichef, my lips are smacking. I love goat cheese. This sounds FAB. oh...my...lord...if I had to have a last meal of my life, this would be it. freaking amazing. Okay, that just confirmed it - places I want to eat at while visiting in the States - Your House! OOOHH, goat cheese, tyler, fantastic appetizer, and it looks incredible! 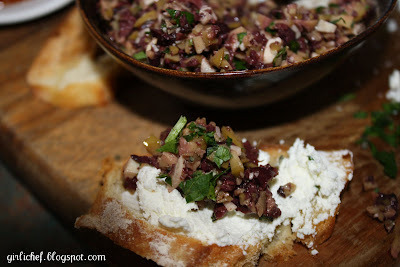 Wow, the baked goat cheese sounds excellent and I love the olive tapenade with it ! Yum! This is all I want for dinner! I could really go for this. I adore goat cheese and anything French. 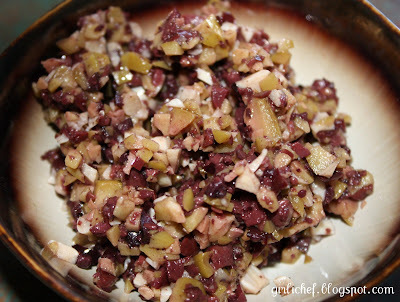 Great with the tapenade. 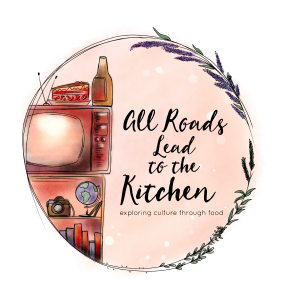 Great recipe post! I work with Chavrie goat cheese and i will definitely pass this recipe around to all the foodies to try. Thanks, Colette. Girlichef, you had me at goat cheese. This looks wonderful. I'll bet sun-dried tomatoes in it would be super, too. Oh, cheesy goodness. How amazing!! Looks absolutely delicious. Man oh man, soft goat cheese or not...who cares. What matters is how AMAZINGLY DELICIOUS this looks. Great job! That looks mmmmgood. Especially with your tapenade. Forget crostini, I want it on a full-on sandwich perhaps with some roasted red pepper as well. This looks delicious! I don't believe I've ever had baked goat cheese before, but it's a great idea. Oh, what a gorgeous spread. 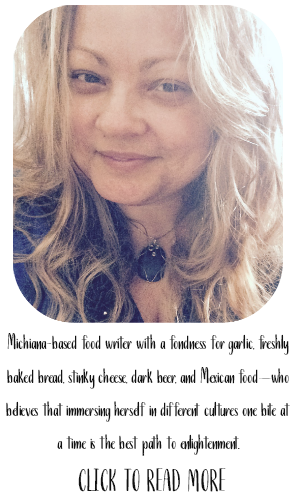 I adore goat cheese, olives, pinot grigio, good bread. My favorite way to eat goat cheese is with roasted garlic and pesto; smear it all on a toasted baguette. Hell, next time I'm putting the smeared slices in the oven to melt. ....oh, me too Arlene...goat cheese shmeared with roasted garlic is like heaven to me!!! btw, I blame this post for today's splurge on goat cheese! haha! 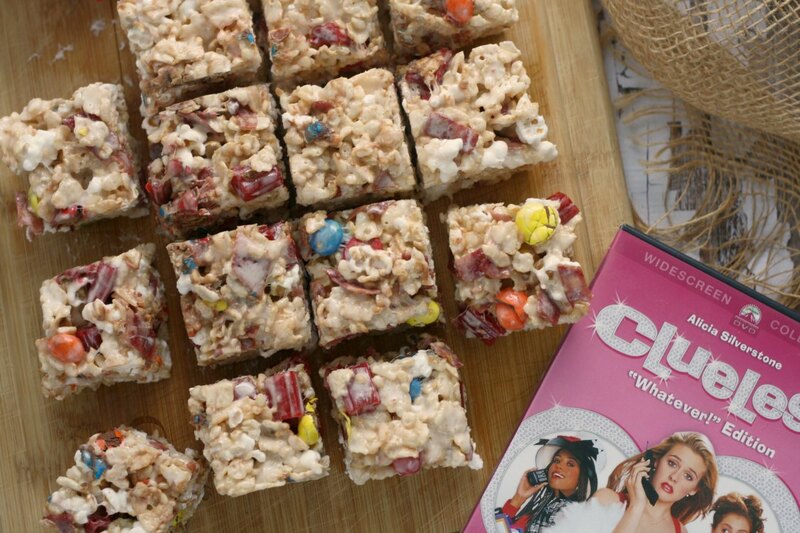 your pic and recipe was just way tooooo tempting! 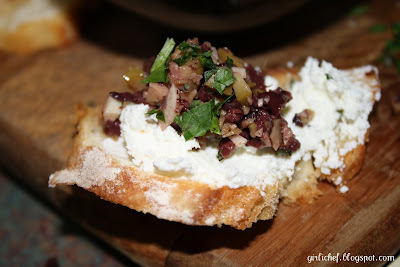 Being a huge fan of: goat cheese and olive tapendade, you know this is on my list. I must pay more attention to Tyler Florence. This is ecquisite. Luscious photos! I love goat cheese and this looks terrific and easy. Great pick!! I didn't know Tyler had this recipe. Now that is a great lunch or snack and so romantic in its own way. Great combo of flavors! This looks simply fabulous, and I'm not a goat cheese fan. I can select carefully...because some do have a little "goatiness" that I just can't enjoy. Still...it looks marvelous and I'd go there with other cheeses! Oh god. That is my kinda food!